The word “negotiation” originated from the Latin expression, negotiatus, which means ‘to carry on business’. One common definition of negotiation is: a potentially beneficial process of interaction, by which two or more parties, with different preferences seek to improve their options through joint actions and decisions. Among the key features of any negotiation is the presence of a minimum of two parties, each having predetermined goals and expecting specific outcomes. Negotiations typically occur between parties that understand the purpose of negotiations, and usually involve resolution and consensus as negotiating parties become willing to modify their initial positions. There are many reasons why we negotiate. Among the most common reasons are to reach an agreement, beat the opposition, to compromise, to settle an argument, or to make a point. In a negotiation, there may be a buyer or seller, a customer or supplier, a boss or employee, a business partner, a diplomat or a civil servant. On a more personal level, our life is filled with negotiation, which takes place between spouses, friends, parents or children, workmates and bosses. There are many schools of thought on this topic and numerous examples of great negotiators with completely different styles and techniques. What is certain though is that art of negotiation is one that takes time and experience to master, much like a game of chess. 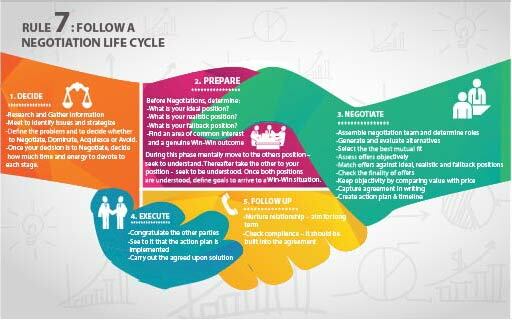 For starters, a good negotiator should be open and flexible, yet firm and confident. One should exercise patience with a demeanour of coolness and maturity. Regardless of rank or position, a good negotiator must also possess good leadership qualities, critical thinking and analytical skills. One must also have a great sense of emotional intelligence that enables them to gracefully steer the negotiations in their favour. Develop yourself purposefully, study, practice and analyse; always remember that negotiation skills are not innate. A patient demeanour is also tremendously important and maintaining this will prevent poor openings and unnecessary concessions. Furthermore, don’t take lightly the virtues of positivity and confidence. If you display these behaviours, you can create an atmosphere that will both calm yourself and influence others. Leave behind your ego! The best negotiators should not be concerned with who gets credit for a successful deal. Their talent is in making the other side feel like the final agreement was all their idea. When being considerate during negotiations, listening skills are important. The best negotiators are often quiet listeners who patiently let others have the floor while they make their case. They never interrupt and encourage the other side to talk first. 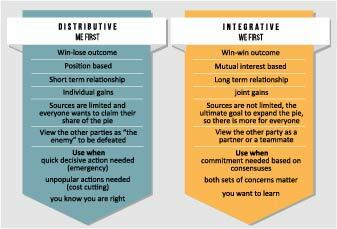 This helps set up one of negotiation’s oldest maxims: Whoever mentions numbers first, loses. While that’s not always true, it’s generally better to sit tight and let the other side go first. Even if they don’t mention numbers, it gives you a chance to ask what they are thinking. You should also remember your manners, we know you’re not children but please remember to keep a diplomatic approach when negotiating. Avoid irritating other and irritable mannerisms and do not get drawn into immediate counter-proposals or attack and defence tactics. Information is the most powerful weapon of negotiation- Gather it and analyse it. When collecting info, establish your ‘Best Alternative To a Negotiated Agreement’ or BATNA definitely for yourself, and for the other party too if possible. As a PM, or buyer of services, you should determine your ideal cost and set another ‘threshold’ value/BATNA, over which you will not go, but will reject the offer. Try to identify the other party’s, BATNA as well. If one does not get this value, one walks away. This tactic will hopefully highlight an intersection between the two BATNAs, which represents the “Zone Of Possible Agreement” or ZOPA. This will be where the negotiation pricewise takes affect. When setting out a strategy, be sure to identify who has the Power Position to decide on the other side- know your opposition! You should also prepare your initial position and proposal, called “Anchor” and the value must be ambitious, but realistic! You can achieve this by establishing the Anchor first, especially if the other party has the power position. Chances are the negotiation will revolve around it. Influencing strategies are key in the bargaining phase. An effort to constantly emphasise the other party’s potential losses and gains should be made and you should make you concessions one by one. Another useful strategy is starting with an aggressive offer and moderating gradually, always remember though to provide social references for potential gains. When making demands, they must always be justified by providing the evidence and the correct setting to make them reasonable. Always stick to your principles. As an individual and a business owner, you likely have a set of guiding principles and values that you just won’t compromise. If you find negotiations crossing those boundaries, it might be a deal you can live without. In the same vein, don’t be persuaded by others problems. In most negotiations, you will hear all of the other side’s problems and reasons they can’t give you what you want. They want their problems to become yours, but don’t let them. Instead, deal with each as they come up and try to solve them. If their “budget” is too low, for example, maybe there are other places that money could come from. When negotaiting, try to defuse with acknowledgement, empathy, patience, impartiality. These traits are both useful and respectable. Early stage negotiation tips: There are some simple ways that you establish your position and desires early. Tactics such as asking for more than you can get and never saying YES to the first offer are very effective. You should also avoid confrontational negotiation whilst playing the role of either reluctant buyer or reluctant seller. Additionally, consider dealing with less emotional issues first. Mid stage negotiation tips: When interacting with others, tactics such as silence management, flattery and intentional delay can be utilised in your favour. Make sure to handle the person who has no authority to decide and never offer to split the difference. Impasses (stuck at a certain point), stalemates (willing to find a solution, but not sure how) and deadlocks (refusal to change positions) should be identified and handle with due care. These important points can make or break a negotiation. End stage negotiation tips: Despite being clichéd, the Good Guy / Bad Guy routine can work effectively, as can employing missing man tactics in order not to decide in hurry. Throughout the negotiation process, you should ‘nibble’ (getting more after the deal is made) and ‘taper’ concessions (the method of narrowing down or reducing concessions). You should also always remain aware of time, use the deadline to your advantage and make the last hour a time to decide tactics. There are many recognised mistakes that have been proven to hinder the negotiation process and these should be avoided at all costs. Expecting result without an established relationship and demanding to be understood without understanding others are two mistakes many are guilty of. Don’t ever be too uncompromising either, by all means stick to your demands but if a deadlock occurs, you may have to budge! Emotion always seems to be a factor in negotiations. Although it is important, it should be used wisely in order to no have a negative effect upon your plans. Emotion can be helpful when demonstrating empathy and promoting a positive as opposed to aggressive stance but don’t let it get in the way. Being too reliant on emotion can blur your focus and distract you. A decision made under an irrational or emotive mindset can potentially be destructive to the strategic plans you have laid out.